In this week’s Folklore and Myth Thursday post I’m focusing on some figures beginning with the letter ‘p’. These include Phaethon, the Pleiades, Partholon, Patollo, Patrimpo, the Pandavas, the Pey, Pamalak Bagobo, and Polong. This week we’re starting off with some Classical mythology before moving on to Baltic, Celtic, and other mythologies. Phaethon, the son of Helios (the sun god) and Clymene (the daughter of Oceanos), “drove his father’s four-horse chariot so fast that he lost control and threatened the world with a terrible heat” (Cotterell & Storm, 2007: 75). Phaethon crashes into the earth when Zeus stops him with a thunderbolt. “It was believed that Phaethon’s mad exploit could be traced in the shape of the Milky Way, while he was reflected in the constellation of Auriga, the charioteer” (Cotterell & Storm, 2007: 75). 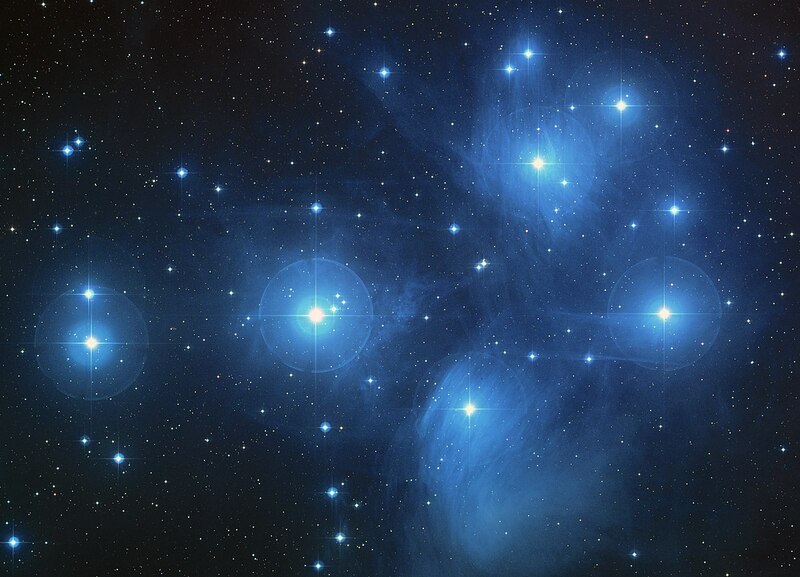 “The Pleiades were the seven daughters of the Titan Atlas, and were named Maia, Electra, Taygete, Celeno, Merope, Asterope and Alcyone. They may have become stars, or doves, in order to escape from the passionate intentions of Orion, the giant hunter” (Cotterell & Storm, 2007: 75). Cotterell & Storm (2007:75) also notes “[their] appearance in the night sky in May coincides with the beginning of summer, and the constellation of Orion then appears to be in perpetual pursuit of them”. On now to a myth of the Celtic world, we have Partholon, the son of Sera, who led one of the early invasions of Ireland (see Cotterell & Storm, 2007: 161). “Together with twenty-fout men and their wives, he is said to have come out of the west after the waters of the Flood had receded and cleared the island of trees ready for cultivation” (Cotterell & Storm, 2007:161). Partholon and his people is said to have lived in Ireland for some five thousand years before an illness struck them all down within a week (see Cotterell & Storm, 2007:161). Patollo is the Baltic god of war and the chief god of the Baltic region – “[the] one-eyed god of battle, magic, inspiration and the dead” (Cotterell & Storm, 2007:218).Cotterell & Storm (2007:218) notes that he “was depicted as an old man with a long green beard and death-like pallor, wearing a turban … [he] bestowed good fortune and … he took it away whenever he had the desire to taste human blood”. Patollo had a pronounced role with regard to the dead (see Cottell & Storm, 2007:218) and was later identified with the Devil by Christian missionaries (see Cotterell & Storm, 2007:218). Patrimpo is the Baltic god of fertility and is associated with rivers (see Cotterell & Storm, 2007:219). “He was depicted as a happy young man without a beard and crowned with ears of grain” (Cotterell & Storm, 2007:219). The decendants of King Pandu, the five Pandava princes “fought the Kauravas in the famous battle of Kurukshetra, which is described in the Hindu epic, the Mahabharata” (Cotterell & Storm, 2007:392). Cotterell & Storm (2007:392) also notes that Arjuna, one of the princes, received spiritual instruction on the eve of battle from Krishna (an avatar of the god Vishnu), who disguised himself as Arjuna’s charioteer. “Krishna’s teaching forms the Bhagavad Gita or ‘Song of the Lord’” (Cotterell & Storm, 2007: 392). The Pey “are demons who drink the blood of the dead and of wounded warriors, and bring misery and bad luck to the living. They are wild creatures with tangled hair” (Cotterell & Storm, 2007:392). This is according to the “Tamils of southern India and Sri Lanka” (Cotterell & Storm, 2007:392). Pamalak Bagobo is, according to the Bagobo people of Mindanao in the Philippines, th god who created humans (Cotterell & Storm, 2007:466). “According to tradition, monkeys once behaved and looked like humans and only acquired their current appearance when Pamalak decided to create humankind as a separate race” (Cotterell & Storm, 2007:466). According to Malaysian and Indonesian folklore, the Polong “is a flying demon created from the blood of a murdered man” (Cotterell & Storm, 2007:467). “Whoever owns the Polong can order it to attack his enemies. The victims tear their clothes, go blind and eventually lose consciousness. However, the Polong also feeds on the blood of its owner” (Cotterell & Storm, 2007:467). Read the previous posts in this series by clicking here. Check out The Folklore Podcast – Yule! Fairies! Slenderman! Awesomeness! And more! Also be sure to stop by Ronel’s blog for her folklore and fiction posts! Cotterell, A. & R. Storm. (2007). The Ultimate Encyclopedia of Mythology. London: Hermes House. Carin, this is so great to offer a catalog of mythical entities. Cool!